If you don't like rap music or more precisely certain types of rap music does that mean that you don't like Black people. Well it might. But as a pure question of logic of course disliking rap music doesn't mean you are a racist. One of the things that is funny about modern life is how thoroughly and completely many people came to associate rap music as the sole music which young black people were permitted to enjoy while still being "authentically" black. The flip side of this expectation is of course how fiercely some black people defend any attack on any type of rap music as being a a racist attack on all black people. Well maybe. Maybe not. I was moved to write about this because of a relatively recent incident in Houston, Texas in which the white female owner of a famed local club declined to book two rap acts because she found their lyrics offensive from both a gender and racial perspective. She also went on to make a few uncharitable (bigoted?) comments about the type of people who came out to enjoy such music. She said that she would continue to book other types of rap music but of course by then the cat was out of the bag. Some comedians and musicians said that they would boycott the club because they felt unwelcome or that the owner was racist. Sara Fitzgerald came to the Heights from Bellaire in 1975 because she heard a rumor: Someone was offering home loans to single women without a male cosigner — an uncommon practice then. She met with Marcella Perry at Heights Savings Association, one of the only banking institutions in Houston headed by a woman in the 1970s. Perry granted her the home loan and the 30-year-old moved to the neighborhood where she soon fell in love with an old crumbling building built in 1918 by Polish immigrants on White Oak Drive. 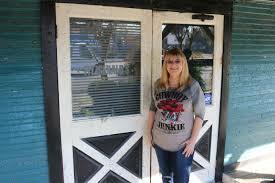 She eventually turned that locale into the landmark venue Fitzgerald's, helping crown her the matriarch of local music. But now, at 68, she's being talked about not for her business acumen, but for what some are calling racist comments she made in an email conversation Feb. 7 with music producer Garrett Brown, who also performs as Trakksounds. 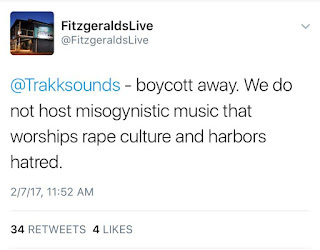 The controversy has sparked calls to boycott Fitzgerald's, or Fitz to locals, threatening the standing of one of Houston's music institutions where thousands of artists have performed for countless fans since 1977. Brown contacted the club owner to inquire about booking successful hip-hop act Starlito and Don Trip. Fitzgerald listened to a song they sent her and replied to Brown saying she didn't approve of lyrics she considered misogynistic and that contained offensive racial expletives. She said some of the language in her email that people are offended by are direct quotes from the artist's songs, while others have expressed anger about her comments regarding hip-hop audiences. I don't see this as a free speech issue. It's the owner's club and within certain broad frameworks she ought to be able to book or not book whatever act she wants at her club. I don't listen to a lot of modern day rap music but it seems that the majority of what's popular has routine use of slurs for black people and for women. This has been pretty common since the late eighties or early nineties. But it's important to remember that up until that time that wasn't the norm in black popular music of any kind. There were of course X rated releases aimed at a certain segment of the adult market but the vast majority of black music pre-NWA didn't have that sort of language. This has been a detriment to music in my opinion. I think it's unhealthy for people to use slurs to refer to themselves. I think that sort of dehumanization is related to intra-racial murders, assaults, robberies, rapes, SAT scores, and so on. No other group in America routinely produces popular music in which they refer to each other by slurs. It's just not done. When you have trouble viewing yourself as a fully functioning positive human being how can you possibly succeed as a group in any endeavor? I don't think someone should be surprised or God forbid offended that a woman club owner might take issue with music lyrics that refer to women as female dogs in every other stanza. It's ironic that this brouhaha goes back to a situation described almost 30 years ago in Spike Lee's movie Do the Right Thing. If you don't like being a customer in someone else's establishment then get off your rumpelstiltskin and create your own establishments and institutions. And then if you want to listen to the aural equivalent of someone smacking you upside the head with a dirty diaper you can do so at your leisure. You can leave me out of it though.